Macros are great. When you've mastered them. But even if YOU aren't using macros, if you look at documents prepared by someone else, there are a few things you need to know. Your Open Office installation can run macros. And macros can bring malware onto your system. So Open Office offers you choices about your macro use. If you use your machine in uncomplicated ways, I suggest that you tell Open Office to stop macros from running. I'll show you how. Even if you can't impose such a draconian "solution" because of macros you need in documents that come from trustworthy sources, there are things you can do to limit the danger of malware from malicious macros. A macro is a bit of computer program. Code that tells the computer to do something. For instance, to silently send to a third party whatever you type into "user" or "password" edit boxes. Once a macro is available on the system, it can be "connected" to a host of events, so that when, say, you save a file, the program that is the macro, runs. Macros can be included in any Open Office document... wordprocessor product, worksheets from Calc, databases, etc. And they can come in embedded in files from other sources, too, of course. No! Far from it! They are an essential part of delivering "clever" solutions to many important wants. If they were always malicious, life would be so much easier... we'd just always "say no". But not everyone's use of a computer involves material that relies on macros. And even if you do, there are steps you can take to let the right ones in, while still maintaining some protection against the rest. I would recommend using "High" or "Medium". Even if you regularly access pages with macros you can use High or Medium without life becoming tedious. 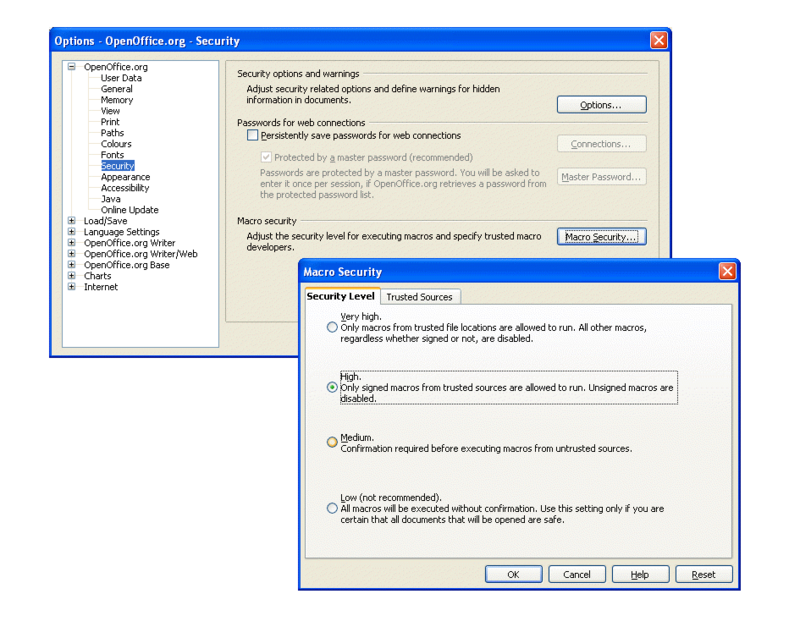 Just switch to the Trusted Sources tab of the Macro Security dialog, and tell your Open Office installation about the reliable source you get macro-equipped documents from. If you have your security level set to "medium", and you load a file with a macro, you will be asked if you want to allow macros to run. Suppose you say "yes". How long will that response be remembered? And how broad will the permission be? I would hope that permission to run macros would only persist until you close the document. Open it again, and, I hope, the system will seek permission again. And what if you open another macro-equipped file while the first one is open. Again, I hope, but do not know, that the system would ask again, get a separate permission to run macros in the second file. Just because someone is paranoid doesn't mean that he/ she is wrong, remember. The chance of catching a virus, if you have good anti-malware software, and look after it? Small. The consequences... sometimes dire. Be paranoid.